This is it! The chicken you won’t be able to stop eating. You may abandon supermarket-roasted chickens forever! The flavors are very similar to Lechon Asado from a much earlier post, but it’s the Honey-Lime Drizzle that will make you weak in knees. Sorry for the rather immodest angle on this picture… it’s very gynecological. But, it’s the lime in the cavity I want you to note. This recipe is as much about the lime, as it is about the herbs and spices…and of course, the chicken. This 9 pound beauty had been hiding out in my freezer. You can do this with any sized whole chicken, chicken breasts, chicken thighs…whatever you prefer to work with. But I must say, a whole chicken makes an entrance. It isn’t demure. It doesn’t sidle in…no, no, no. It comes in, feet in the air, breast thrust forward, wafting its goodness for all to experience. The flavor combination for this is a very familiar combo in Cuban cuisine. It’s more or less the same blend I massage into the Lechon Asado (Cuban Roast Pork), sprinkle lightly on fish and of course, smear all over chicken. Speaking of massaging, REMEMBER—every time you touch the bird, wash your hands with soap before touching a spice bottle, a wooden spoon, a towel, etc. The Goddess wants you to use proper asepsis; NO cross-contamination here! Now, having said that, I put the spice and herbs on a sheet of aluminum foil or a plate, then I add them as needed, thus not having to touch spice bottles with icky hands. But you need to get personal with the bird…really get all the seasonings into every nook and cranny, as well as the cavity…if you’re doing it properly, you may need a cigarette afterwards! Dry the chicken off with paper towels (it isn’t necessary to wash it and is safer if you don’t…the oven heat will kill the nasties). Plop the bird into a large oven-proof pan or skillet. You may truss, tie the wings and legs together, or not. It’s up to you. Drizzle with olive oil and lime juice; rub it into the bird. REMEMBER—every time you touch the bird, wash your hands with soap before touching a spice bottle, a wooden spoon, a towel, etc. No cross-contamination here! You may combine the seasoning blend ingredients or simply sprinkle them individually over the bird and in the cavity. Don’t forget the cavity. Preheat the oven to 350°F. After you get up-close-and-personal with the seasonings and the bird, place the whole pan in the oven. I let it roast for about 7 minutes per pound. Then, increase the oven temperature to 450°F and continue to roast until the breast registers 165°F, for a chicken this size that’s about 45-60 minutes. 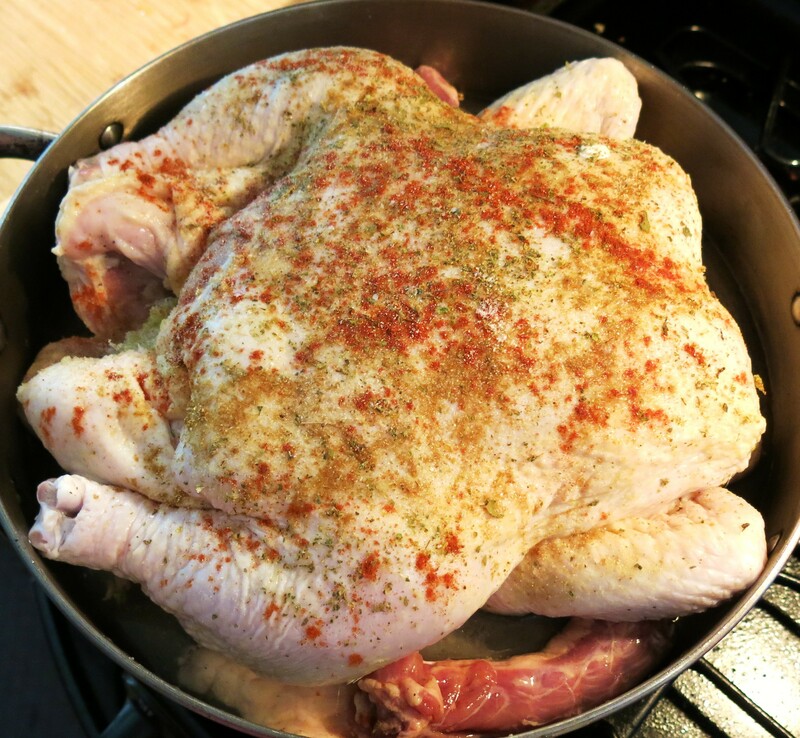 Remove the chicken from the oven and remove the chicken from the pan to a serving platter. Cover loosely with foil and let rest for at least 15-20 minutes before carving. While the bird roasts, heat the honey until is loosens up a bit, about 10 seconds in the microwave. Stir in the lime juice, beginning with the lesser amount. Taste and correct as desired; set aside. While the bird rests, pour the drippings from the pan; skim as much fat as possible, discarding all but about 2-3 tablespoons. Return the reserved fat to the pan and over medium heat, make gravy or simply reduce the drippings until they thicken slightly. Carve and serve with gravy, if desired and the Honey-Lime Drizzle. 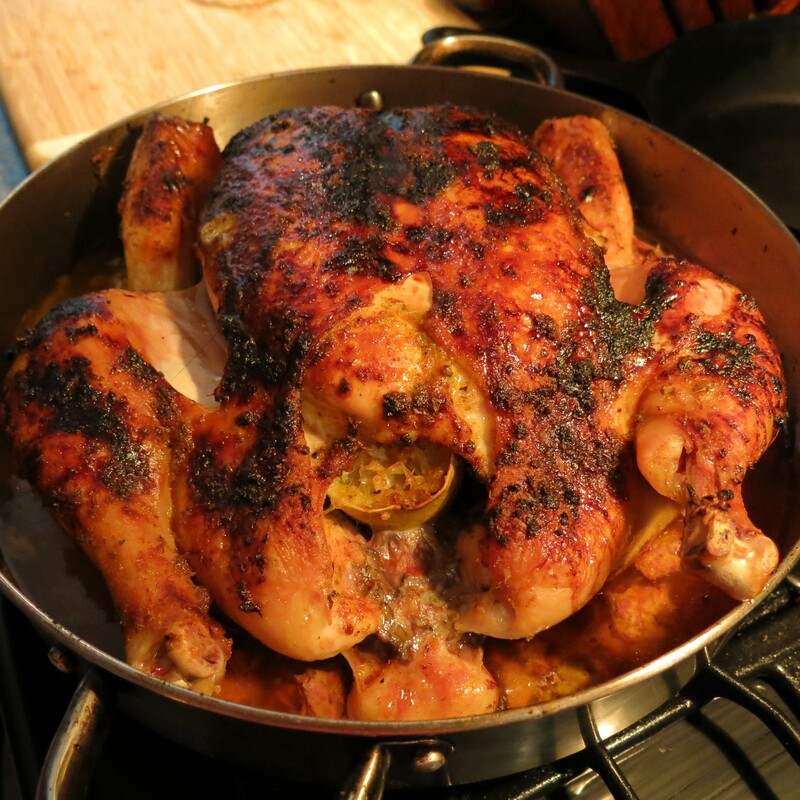 Cuban-Style Roast Chicken Recipe©Marcia Lahens 2015. All rights reserved. See…it’s pretty simple. I opted to sprinkle the seasoning ingredients over the oil-rubbed chicken, a squeeze of lime juice and then I rubbed the mixture around and inside the chicken. You can use fresh, finely minced garlic, but for this version, I really prefer the granules…but that’s up to you. Remember to put the squeezed out lime shell in the cavity…why would you throw that out? There still a heap of flavor in that shell and that flavor will end up in the gravy. When I roasted this bird I started with a 350°F oven for about an hour and then upped the temperature to 450°F. It took about another hour before the internal temperature of the breast registered 165°F. I like to do a “hot roast” at the end, but some people prefer the opposite. Play around with it and see what you think. After the bird was perfectly roasted and resting (don’t skip the resting part! ), I drained the drippings, skimmed most of the fat (don’t pitch it out! 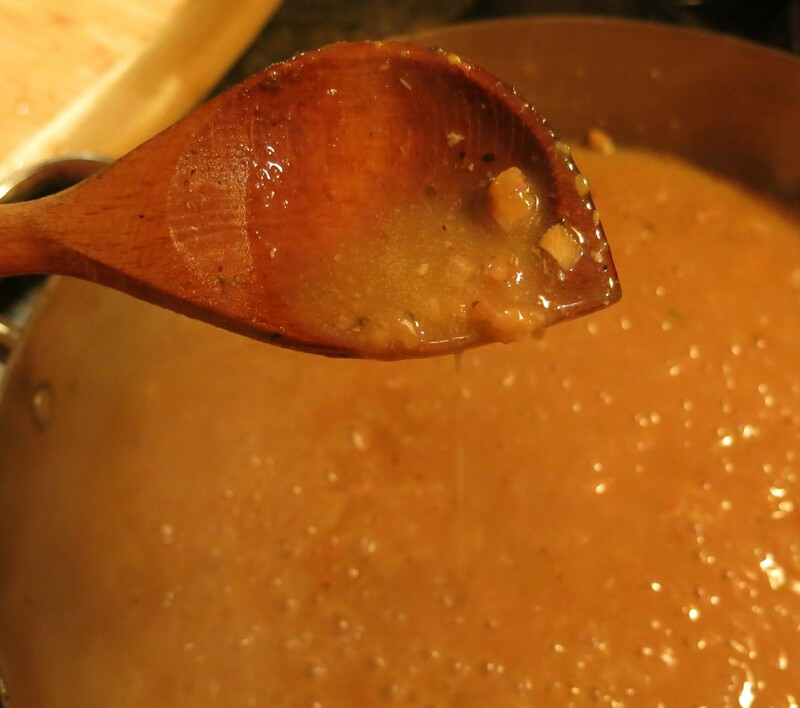 ), tossed some chopped shallots into about 2-3 tablespoons of the fat (that’s why we keep that fat) I skimmed off the drippings and made gravy. 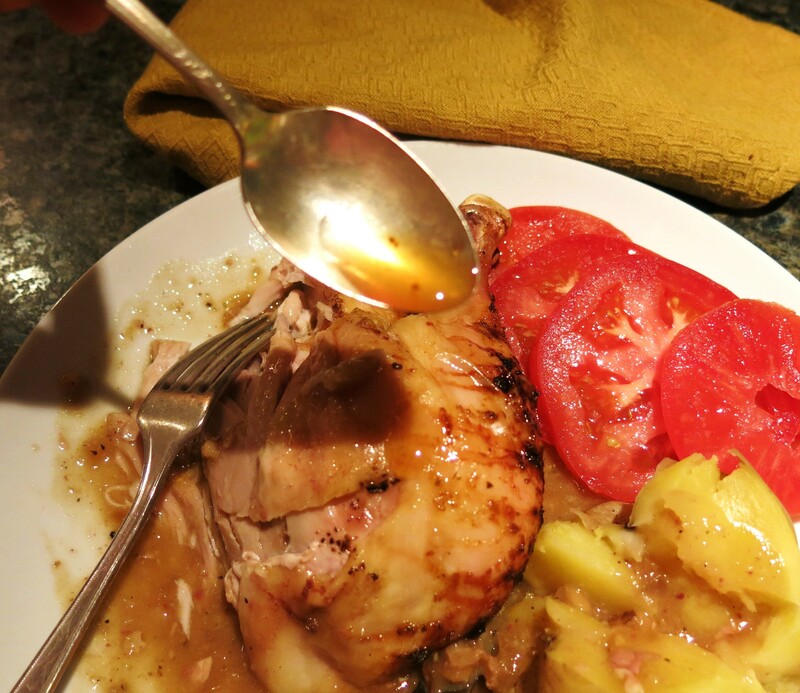 Really, Cuban or otherwise, what’s chicken without gravy? Do NOT, whatever you do, leave out the Honey-Lime Drizzle. Seriously, it makes this dish sing. It truly does. You will definitely want to have plenty, as it’s good drizzled over slices of the leftover meat, be it a sandwich or over rice or with pasta. Also, feel free to adapt this to use chicken breasts or thighs. The process will be the same, but the cooking time will need to be adjusted downward. I would stick with the 450°F oven ONLY. Leaving the skin on will definitely give you the best results, as it helps keep the meat moist and it’s just plain delicious. One last thing…how about using this seasoning blend, with the Honey-Lime Drizzle, for your Thanksgiving turkey? Maybe it’s time for a new “tradition”. I’m just sayin’….